This Christmas Santa Claus brought my girls their first ever joint Christmas present with a note attached "To Share and Enjoy Together" I think he was trying to tell them something. My girls, Chloe who's 11 and Lily aged 6 don't often play together as it always ends up in tears so this year we decided to try something a little different to give them a nudge in the right direction. When I first saw the price tag I must admit I was a little shocked as it's quite high (£64.00) but I was willing to give it a chance. The cost was the main reason I decided the girls should share it, as I couldn't possible give it to just one of them when they both love Monster High. The Monster High High School comes flat packed in a large box but it was really easy to assemble. The main building folded out in a really simple yet clever way, even I managed it. All the other pieces like the tables and the desks came in individually wrapped packs so that the pieces were separate which also helped a lot when it came to putting them together. Let me take you on the guided tour, starting with the front door which opens nicely to let you inside. I love the attention to details, the ghoul statues at the entrance are awesome. It has big door knockers just like a really spooky building too. There are 4 main areas once inside, a classroom, a dinner hall, a balcony and a sport area outside. 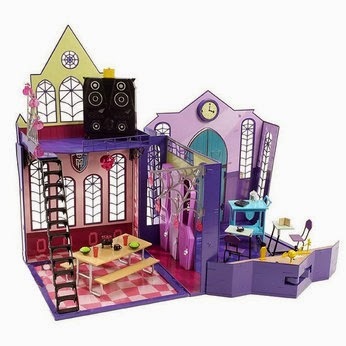 There's lots to enjoy with this playset, my girls adore it. They've been playing together for hours, it's been lovely. 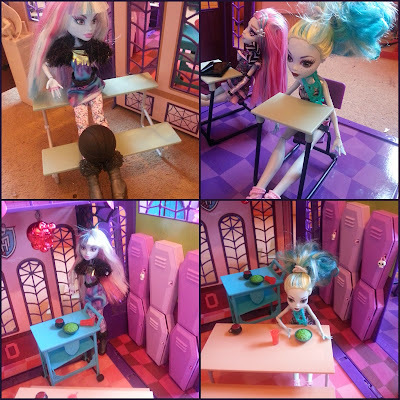 My girls love the way there is lots of places for their dolls to go, they can sit at the desks or on the bench. They can push the trolley or relax on the outdoor seats. The dolls fit inside the High School really well which makes playing a whole lot easier and more fun. The school is bright and colourful with lots of pinks and purples which my girls love. The lockers can be locked with little skull padlocks or left open to use when they want. There's also lots of little play pieces to use whilst playing including spell potion items and books, bags and learning aids. There's food items and drinking cups, cauldrons and even a disco ball. I was really surprised with all the stuff it contained, this really is a ready made playset as long as you already have some dolls as they aren't included in the price but that wasn't a problem as my girls wanted to choose their own anyway. There's so many to choose from, I didn't want to pick and get it wrong. 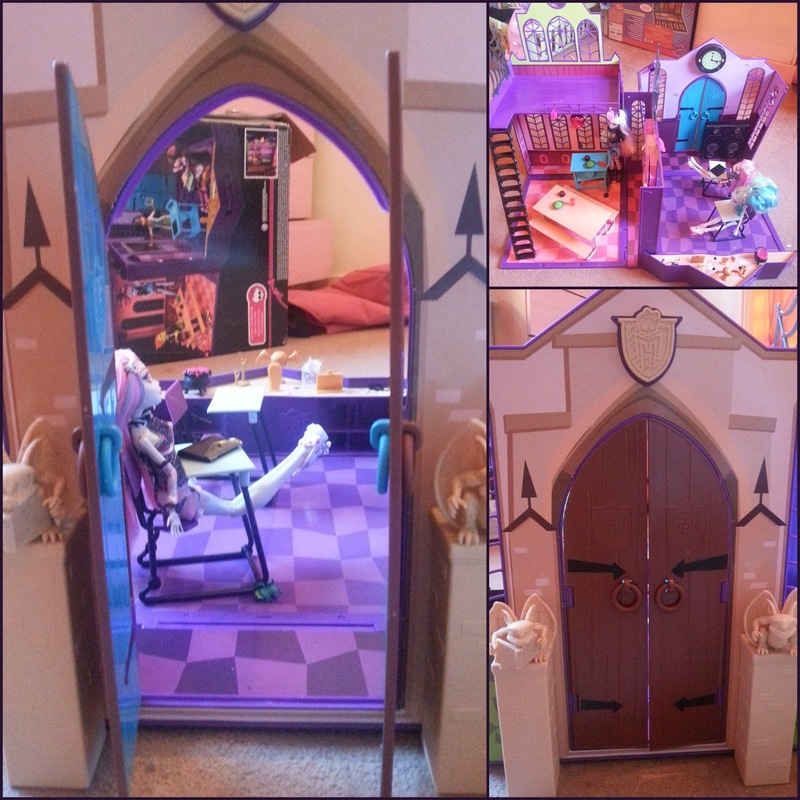 Both my girls and I give the Monster High High School a fantastic 5/5. It's definitely ticked a lot of the right boxes for us and done what I had hoped it would, my girls are now playing happily together and actually enjoying it so in my eyes it would have been money well spent! 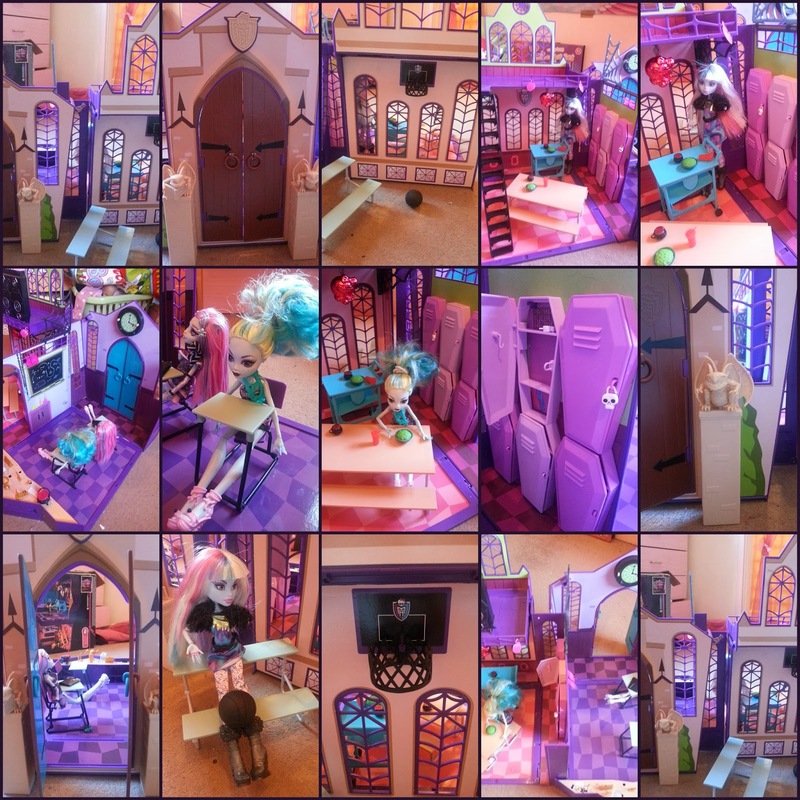 Disclosure: We received our Monster High High School for free for the purpose of this review as part of the 2014 Toys R Us Toyologist Programme but our Reviews are 100% honest and all the opinions given are my own.